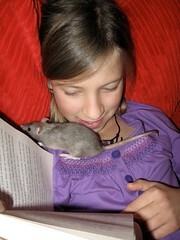 Schooling from the heart: Eleven... and Rats! I want to play in that dollhouse! I've been a rat lover since I was a teenager, and they are truly unsurpassed as small pets--they are the only rodents who love you back! YEAH! Welcome to the rattie community :D We got pet rats last summer (2) and then adopted 2 more because we fell head over heels. They are absolutely fabulous - lovers, sweeties, gentle, kissy-faced cuties. I blogged about them twice, so I'll put the links down in case you want to show your daughter some fellow waldorf homeschooling rattie buds for her babies...also so glad to hear you did puchase more than one as they are colony animals and are truly lonely without a buddy. Also, there are some great you-tube videos, specifically look up Jorats. 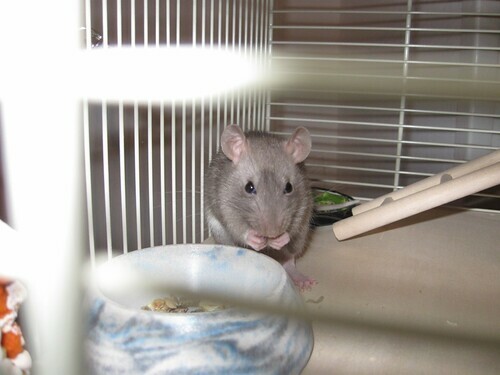 She has about 80 adopted (rescue) ratties and is up in Canada (see the one called "Rats Love Bananas". She also has a great rat forum called www.Jorats.com. They will help you if you have any questions or concerns. My dd started fantasizing about rat ownership when she was almost 10. Maybe it's the age? Anyway, I informed her that maybe someday we could get 2 (you really DO need 2). And then another homeschool family announced that they needed a new home for their 2 rattie girls since they now had horses and thus less time for the rats. So, it was fate, it seems, that we become rat owners a couple of months ago. And I'm amazed at how entertaining they are. Older dd tried to start clicker training them, but we need to work on separating the 2 rats from each other (and also the cats) while training. Oh, yay! Thanks for chiming in rat loving friends. Jen, thanks for the great links! 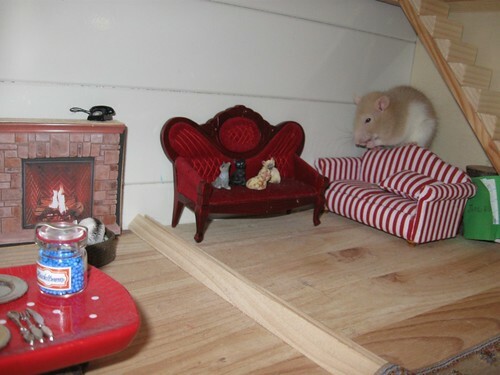 Gail, we love your rat decor! 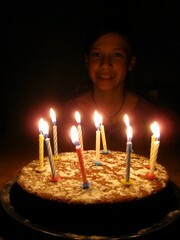 Sunburst was very pleased to see that other homeschoolers are rat happy-- and she loved seeing them on your blogs, too! Very cute rats! Oh hooray!! I'm so happy to see that you're back :) I found your blog the day you posted your advent post and thought that I must have jinxed things somehow...glad to hear that your absence was due to travel and adventures instead of any questionable mojo from me! Since moving to Switzerland I get this weird, gnawing depression in December... lack of sun, maybe? Too frozen to type? --And then, yeah, we went to the states to thaw out in January. Seems to have helped!! Here's one link, but there's tons of info on the web.